Tahoe Model Works. TMW-102 50-Ton Dalman 2-Level Trucks with Lateral Motion Detail, RP-25 Wheelsets only. Available with RP-25 Wheel Sets, Semi-Scale Wheel Sets (.088 wide), or Frame Only. 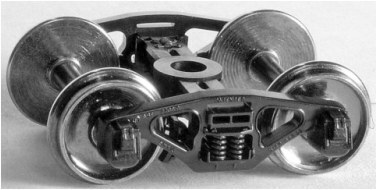 Trucks feature one-piece acetal plastic moldings with separate brake shoe detail. See the Tahoe Trucks page on our Website Main Page, Left side for Tahoe Information Flyers and truck user lists. Please note that trucks purchased with wheelsets are subject to availability. NOTE: Priced per pair. Westerfield Models now offers volume discounts on Tahoe Model Works Trucks. For 1-3 Frames, the price is Standard. For 4-8 Frames, price is $7.50 ea, use COUPON Code: TMW-WHEEL-4TO8. For 9-14 Frames, price is $7.00 ea, use COUPON Code: TMW-WHEEL-9TO14. For 15-20 Frames, price is $6.80 ea, use COUPON Code: TMW-WHEEL-15TO20. For 21-25 Frames, price is $6.50 ea, use COUPON Code: TMW-WHEEL-21TO25. For 26 Frames and up, price is $6.25 ea, COUPON Code: TMW-WHEEL-26UP.